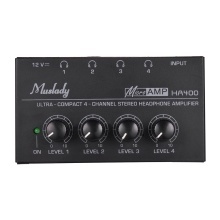 Ultra-compact stereo headphone amplifier for studio and stage application. With 4 headphone output channels and 1 input channel. Volume of each output channel can be controlled independently. Provides highest audio quality for each headphone even at maximum volume. Ultra low noise 4580 operational amplifier for outstanding audio performance. Comes with a DC 12V power adapter.